Born from a sign taken from everyday life but deeply rooted in Rome’s architecture, the Parentesi bracelet is inspired by the travertine junctions of the roman pavements. This unmistakable motif, originating in the late 1970’s, became immediately a trademark to Bulgari and a statement for strong, voluminous, and almost endlessly modular jewelry, reflecting the infinite spirit of Rome. High Jewellery bracelet in rose gold with mother of pearl and pavé diamonds (18.56 ct). 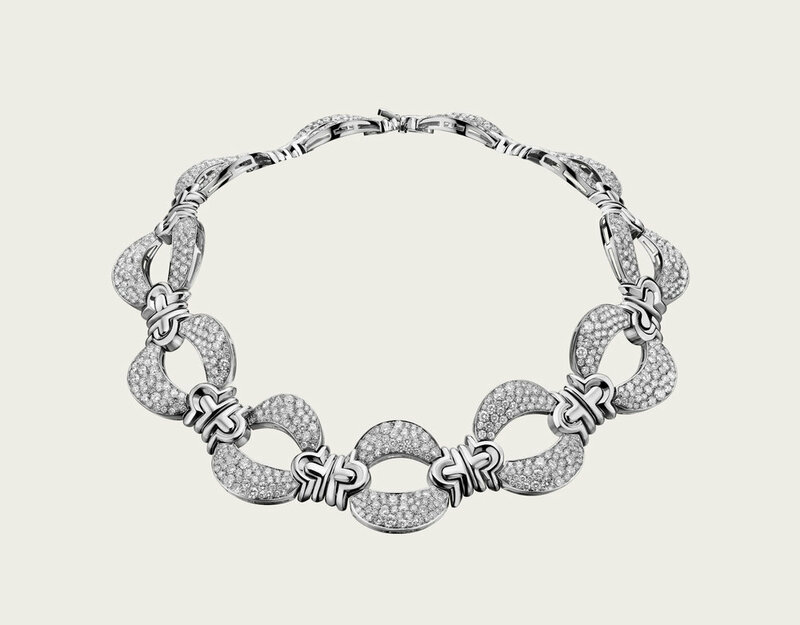 Combining the geometric motif with the movement of diamond pavé, the Parentesi necklace shines with feminine resplendence and with the eternal spirit of its Roman inspiration. Linked and rounded, the feminine Parentesi Hamata necklace is meticulously set with rich diamond pavé, shining with the eternal charm of its Roman inspiration.